Evergreen recycling is a great way to get more engagement on your posts! When you use Evergreen Recycling, your content gets seen by more of your audience than if you were to only post once. How can I edit an Evergreen post for future cycles? Evergreen content is anything which isn’t time-specific, meaning you can post it again days or weeks later and still reap the benefits. This can include photos, quotes, videos, GIFs, blog posts, or self-promotional posts. How do I create Evergreen posts? In the Post Editor, you'll find some options that let you choose whether to publish the post once, or mark it as Evergreen content. If you mark the post as Evergreen, it will be re-added to the bottom of the Queue each time it is published. You can then set the post to expire after a certain number of cycles, or a specific date. Once an Evergreen post gets published, it gets copied and added to the bottom of the Queue — so it will be re-posted once you go through the remaining posts in the queue for that Category in that account. As an example, let’s say I have a category called Inspiration and have set up a Timeslot for 12:30pm on Wednesday to post from my Inspiration Category. If I have four posts tagged Inspiration, SmarterQueue will publish Post #1 first. After Post #1 is published, it will return to the bottom of the Queue to be posted again once the other three posts have been published. 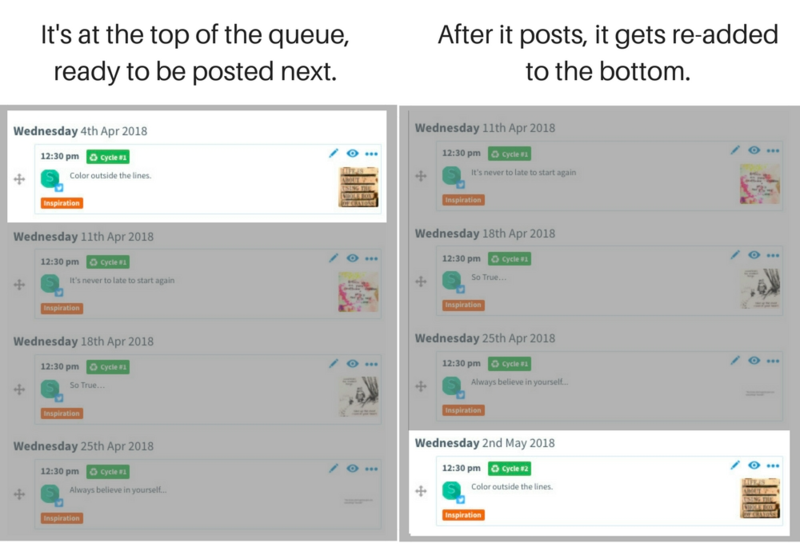 So if all of the posts in your Queue are marked as Evergreen posts, you’ll keep having posts added to the bottom of the Queue after they’re published, so you’ll never run out of posts. There’s only ever one copy of an Evergreen post in your Queue at any one time – that is, the post that will be published in the upcoming cycle. After it is published, we move the post back to the bottom of its Sub-Queue, ready to be published in the next cycle. You can edit the post at any time, and the new content is what will be used for all future cycles of that post unless you edit it again in a few cycles time. We recommend tweaking your Evergreen content every few cycles, to keep things fresh, and to test whether different text/image may perform better. There are some limits in place, to prevent your Twitter or Facebook account from being flagged for spamming duplicate content. We don’t allow the same post text to be published twice within 24 hours. This is true whether you try to post manually, or have scheduled posts. Your Evergreen Queue can’t repeat more than twice per week. In other words, you must have at least half as many Evergreen posts, as you have Timeslots. For example: if you have 10 timeslots per week for a particular account+category, you need to have 5 or more Evergreen posts in that Queue. If you don’t have many Evergreen posts in a Queue, you have to spread out your Timeslots, so that the same post isn’t published twice in one day. For example: if you have 10 timeslots per week, and 5 Evergreen posts, you can’t have more than 5 timeslots on the same day. This would result in the same post being published twice on that day.